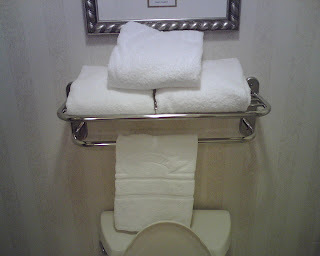 I, for the life of me, cannot figure out why hotels leave you three towels. Sometimes a person showers at night or after the gym and then in the morning, that is two, and then you are left with the extra towel. Then, if there are two of you in the room, and you both use one towel at night then one of you is left with the soggy towel in the morning which no one wants. Three is too many for 1 person and not enough for 2 people so why three towels??? For those hoteliers out there, consider throwing in another towel. The one clean towel left on the rack when I am traveling alone is a source of irritation but not nearly as bad as when I have to fight with my better half over who is going to get stuck with the soggy towel in the morning. End this mystery now so there can be harmony in hotel world again.